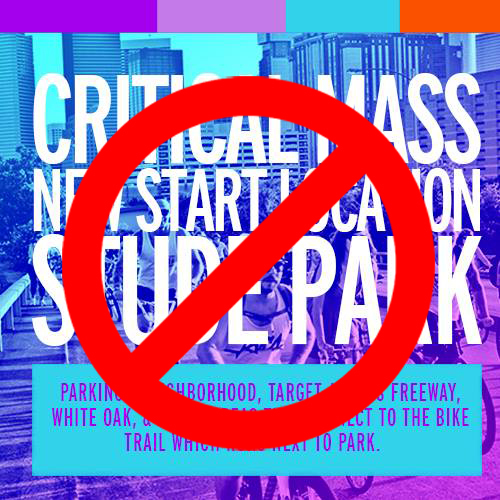 On June 8th it was announced that Critical Mass Houston would be relocating the meeting place for their major monthly bike ride to Stude Park. This was announced in a video posted to their Facebook page. We shared the video to the WHCA Facebook page to inform neighbors of this fact. As you might expect, this announcement caused a great deal of discussion in various forums. There were numerous threads on Nextdoor, with many people sharing their past experience of the ride. The were many voices both for and against this change. Some legitimate concerns were raised by both the organizers and those concerned about the impact of the event on the neighborhood. "UPDATE: Hello Woodland Heights. Wanted to update you all and let you know that Critical Mass WILL NOT be meeting at Studewood park. I do want to thank the few residents who stepped up to offer assistance and anyone else who showed patience and understanding. We'll see you the next time we pass through the heights. Again, you're all invited to come join the ride on the Last Friday of the Month. We'll post the new meeting spot as soon as we confirm." A big thank you to everyone who came together to help Critical Mass find a new meeting place that would meet their needs, while minimizing the impact on the neighborhood.